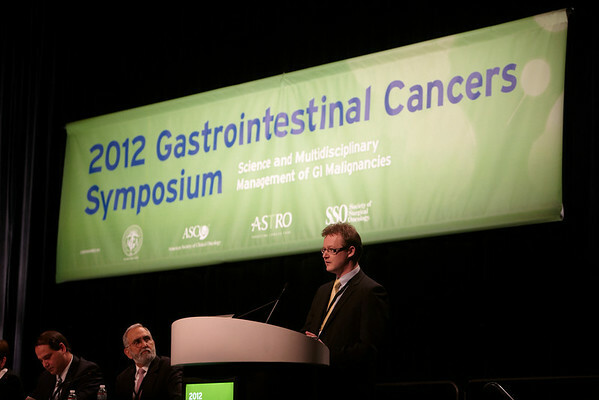 San Francisco, CA - ASCO GI 2012: Dr. Russell D. Petty addresses attendees during General Session I: Cancers of the Esophagus and Stomach: Prevention, Screening, and Diagnosis--ABSTRACT #1 at the 2012 American Society of Clinical Oncology (ASCO) Gastrointestinal Cancers Symposium here today, Thursday January 19, 2012. Over 3,000 Physicians, researchers, healthcare professionals, advocates and survivors from across the United States and over seas attended the meeting which features the latest research on Gastrointestinal cancer treatment and prevention. Date: Thursday January 19, 2012 Photo by © ASCO/Todd Buchanan 2012 Technical Questions: todd@toddbuchanan.com; Phone: 612-226-5154.